I love birthdays. To me, they're like a special holiday just for you. I really enjoy planning family parties for my children; I think I enjoy planning their parties almost as much as I enjoy being a part of them. My son has been all about Minecraft these days. (Although World of Kefllings is running a close second.) 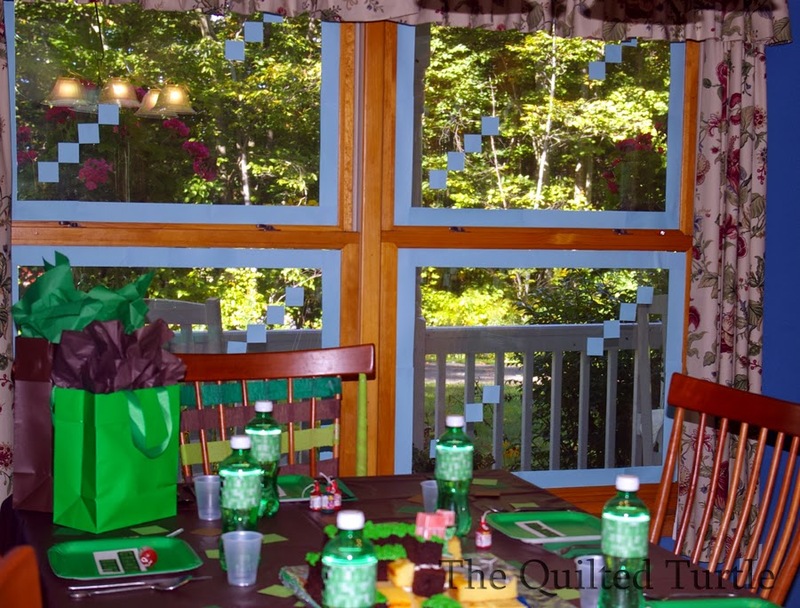 So, of course, he wanted a Minecraft birthday party. What fun. Lots of kids love Minecraft, so I knew there'd be tons of great ideas out there. We didn't eat anything fancy - just kid friendly hamburgers and hot dogs, but we did drink Creeper Juice, A.K.A. Diet 7-Up spruced up with new labels. I made them labels in photoshop, using this image as a starting point. 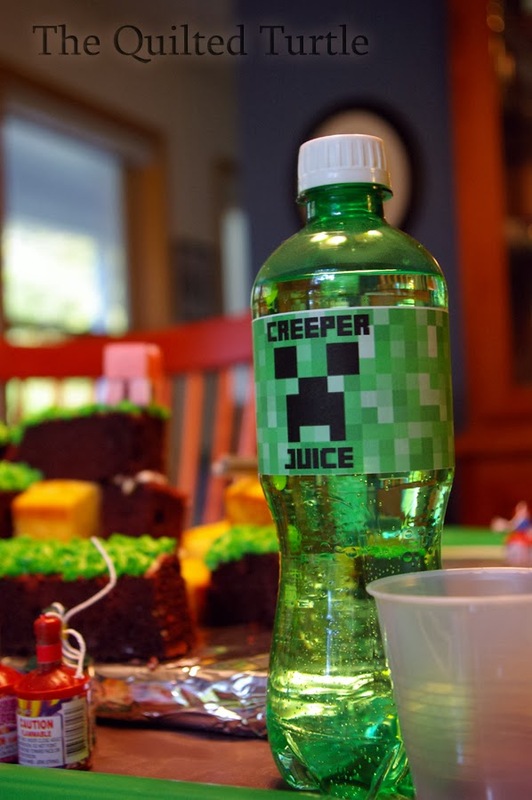 Then I just added the "Creeper Juice" using this font. The image is sized to completely cover a Diet 7-Up label. If you want to use it, feel free. I printed three at a time in Microsoft Word. (The image will appear cropped below, but the full-size image download.) I'm not sure if it will cover the labels for other brands. I suppose you could pull them off; Michigan has a bottle return law, so I didn't want to remove them. The table was tough for me because I didn't want to spend a ton of money on decorations what would just get tossed out after dinner. I bought one of those cheap plastic table cloths - brown of course, and then made everything on the table different shades of green. I did splurge a bit on the paper plates, but when I saw the square ones, I had to have them. 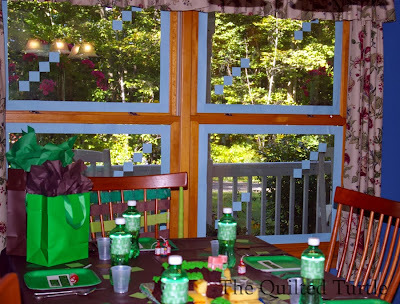 It worked out perfectly that scrapbook paper was on sale at Jo-Ann Fabrics the week before the party. I cut each piece into two inch squares and scattered them over the table. 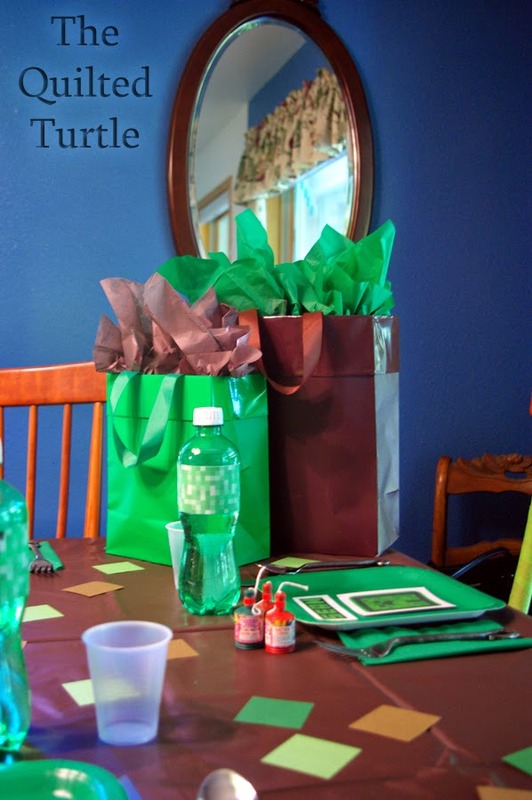 Each guest's place was marked with a name tag (free - made here.) My son loved how they they looked like they came right out of the game. 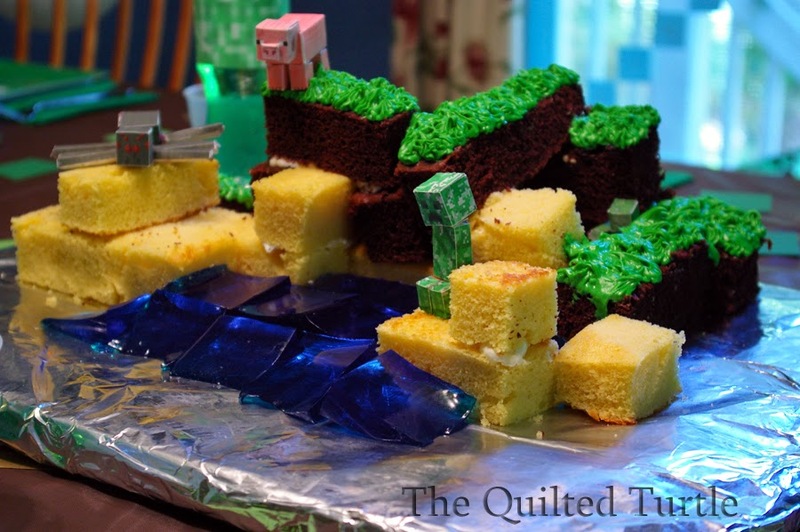 I also printed out this wonderful (and free) Minecraft birthday banner. Of course, we had to make the dining room windows look like they were made out of glass blocks. 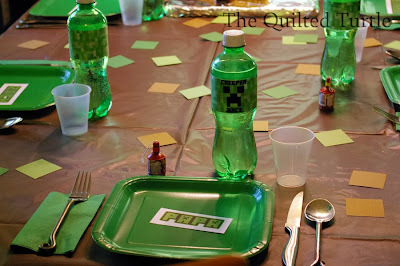 I was super excited to find the brown and green gift bags at Hobby Lobby - they were perfect for a Minecraft party We put the poppers on the table because in the game, Creepers (silent green monsters) sneak up behind you and explode. Since Allen is the cook of the family, he made cake. (He's an amazing cook. Although, if the challenge involves cooking a meal over an open fire or in an early American open hearth kitchen - I can cook him under the table!) While it may not look very cake-like to the untrained eye, trust me when I tell you that most nine year-old boys will immediately recognize it as a Minecraft Cake. I decided to do something different with my son's birthday shirt this year. Now that he's nine, the stuff I've been doing seemed rather juvenile. Plus, S and his dad both love tie dyes. Just look at those flowers! Can you tell, it's been a month or two since we actually celebrated?That garden is under two inches of snow this morning. If you like the shirt, pop into this wonderful little shop over on Etsy. 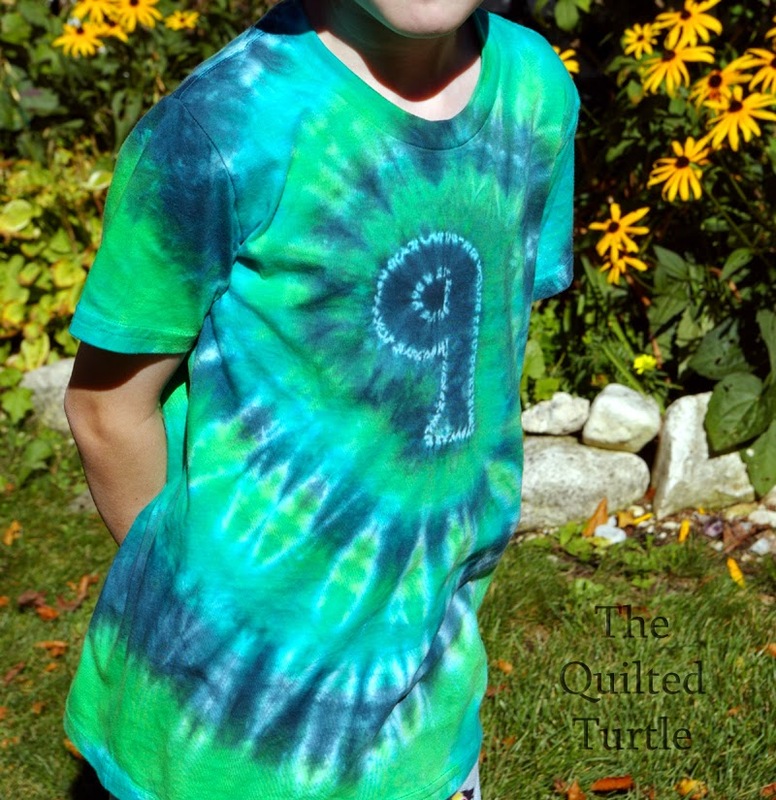 Cassie makes amazing custom tie dyes and can pretty much do anything you want. She was quick and even had shirt suggestions for my very skinny son. So many wonderful things here!! First off, I too have a Minecraft loving son. Even at 13, he and his friends are crazy about it. I like the creative side of it all, and that the online atmosphere is calmer than others (we won't allow certain ones because of the online community). As to the half way mark, I am constantly reminded that we likely only 5 or at the most 6 years left. And part of me thinks that's ok (he is most definitely a teen-ager after all) but part of me is still with my little boy (helps that he's been slow to get tall, so he is not quite my height, although his feet show his eventual growth as he is now 6 sizes bigger than me in shoes). PS And I won't tell him about the snow as he will be sooooo jealous! Back to tell you that son says the windows are his favourite part! 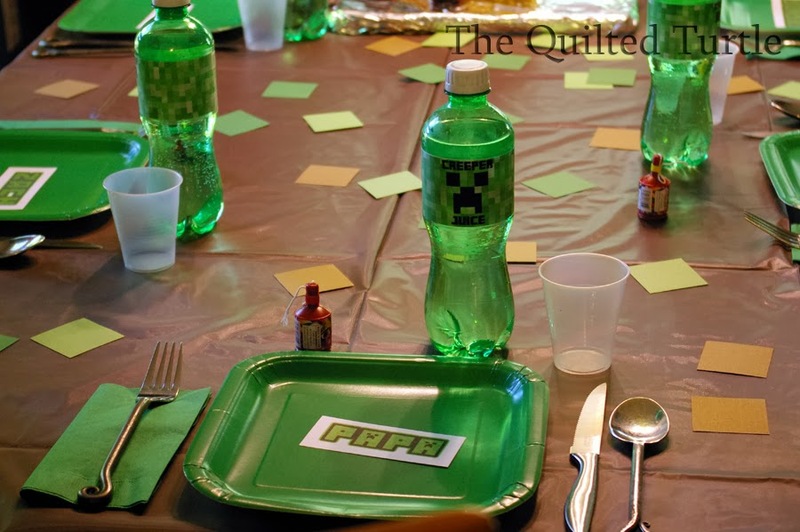 What a great Minecraft Birthday Party! The cake was especially brilliant!!! Hard to believe he isnine already. I love reading of your ideas. YOu are very creative!